This is a book written by NOMA Hisashi. He won a Tenran Shiai (tournament with the presence of Emperor) in 1934. He received the title of Kyoshi when he was 30. It was very rare even back then. This book is not written to introduce kendo to the general public. This is written though his view towards kendo. You can see how this guy sees kendo and his attitudes towards kendo. We can learn a lot out of this book. There is an English translation available for free on the Internet. 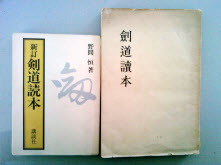 It is a good book to know how a pre-war kendo practitioner train and what kind of attitudes they had towards kendo. If you want to get a copy of this book and simply google "kendo reader noma". Here is a search result from Google. Unfortunately, there are no copies available on Amazon Japan now. Share your review on Kendo Reader here!